Imagine yourself sailing around Greece, experiencing two very different seas and immersing yourself in the magical, mythological Mediterranean. Cruise along the Sporades Islands, located off the eastern shore of mainland Greece, which are known for their golden sands, crystal clear waters, and quaint little villages. Or discover the greenery of the North Ionian with its beautiful islands, mainland coast, and stable winds. Wherever you choose to charter in Greece, you can be certain of one constant, a warm welcome from both the locals and the weather. Discover the mythological land of Greece. Shopping, fun, and culture go hand in hand. Immersing yourself in the magical, mythological Mediterranean. Deserted bays, traditional fishing villages and stunning landscapes.. Enjoy beautiful sceneries, picturesque coves and fun activities. Discover the greenery of the North Ionian with its beautiful islands. Boats awaiting their charterers. Greece offers golden sands, crystal clear waters. GREECE BAREBOAT CHARTERS - The ultimate in privacy & freedom, bareboat rentals are for groups having their own qualified skipper. Hiring a captain and or hostess/cook always remains an option. For a list of our available Bareboat yachts, please Click Here. The sun shines in Greece for over 3000 hours a year, but this is just one of many reasons that make Greece worth a visit. Sailing around Greece you will experience two very different seas, the Ionian and the Aegean, where you will discover a magical, mythological Mediterranean. Milina, Sporades Base: The Aegean islands of the Northern Sporades are very popular with tourists looking to enjoy their golden sands, crystal clear waters and quaint little villages. The close distances between the islands make it ideal for a short hop, quick stop stay. 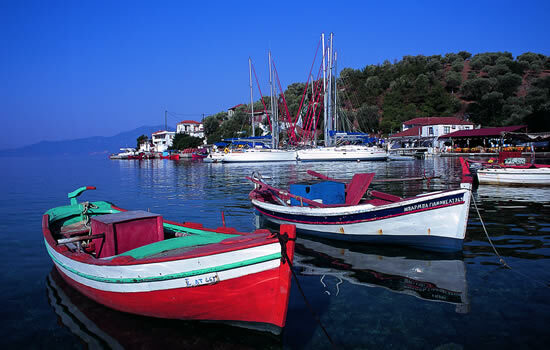 Milina is a small, attractive seaside village located on the eastern shores of the Gulf of Volos. The base itself is located in the tranquil waters of Porto Vathudi, sheltered from the prevailing winds and the open fetch of the Gulf. Kos Base: The Dodecanese Islands lie off the eastern edge of the Aegean Sea adjacent to the coast of Turkey. A major yachting center, the isle of Kos is one of the largest in the group. Sailing in Kos waters is absolutely splendid, entailing open-water passages long or short between the 14 large islands and more than 40 islets, or longer forays into Turkey or west to the Cyclades Islands to further explore this fascinating cruising ground known for its superlative beaches and excellent snorkeling and scuba diving. A Kos yacht charter delivers an inspiring blend of the historic and the modern. Lefkas Base: While some of the sailing destinations in Greece entail open-water, often spirited passages well offshore, a Lefkas yacht charter is far more sedate and family friendly. Set in the protected waters of the central and southern Ionian and Echinades islands off Greece’s northwestern shore, a Lefkas sailing vacation is a romp through history, literally an opportunity to cruise in the wake of Odysseus. Snug anchorages, gorgeous beaches, excellent snorkeling and scuba diving, and quaint fishing villages are all just a short sail away. Lavrion Base: If you are seeking a sailing vacation that’s packed with terrific conditions, beautiful landscapes, historically significant ancient ruins, secluded islands, vibrant nightlife, a warm culture and terrific cuisine – Greece is the place to be. Located on the southern tip of mainland Greece on the eastern coast, Lavrion is perfectly situated for an exhilarating sailing vacation through the wondrous cruising grounds of the Saronic Gulf and Aegean Sea to experience the culture and history of the Cyclades, Dodecanese, Sporades, and Ionian isles. Vounaki Base: The base in the southern Ionian is at Vounaki, where the marina and beach club nestle at the foot of the imposing Arkanika Mountains. The village of Paleros, with its shops, bars and restaurants, is a 15-minute walk away. Whatever type of Greek sailing vacaiton you are seeking – be it Yacht Charter, Flotilla or Beach Club - you will find it at Vounaki. A Kos sailing itinerary takes you to the beautiful bays and coves of the Dodecanese Islands, with quiet villages and busy tourist destinations, secluded harbors and scenic coves, and historic sites and pristine beaches that are so much a part of the unique character of this cruising ground in the southeastern Aegean Sea. A Lefkas sailing itinerary takes you to the beautiful bays and coves of the Ionian Islands off Greece's northwestern shore. They are among the most scenic in Greece, with woodlands spread over the hills like an emerald carpet. 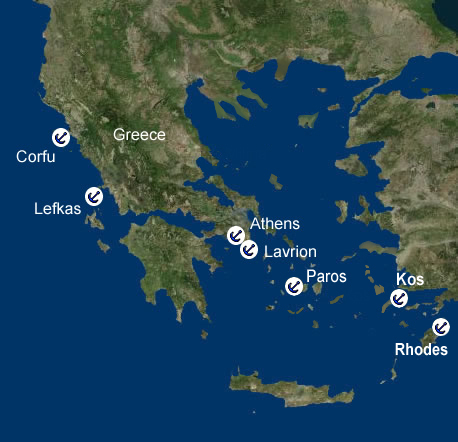 An Athens yacht charter offers one of the most beautiful and diverse cruising grounds in Greece with a wide variety of possible sailing itineraries. Set sail in to the Saronic Gulf and around the Cyclades Islands to explore beautiful bays and coves, historic sites and scenic beaches, quiet villages or busy tourist destinations. Between Corfu and Kefalonia you will find idyllic anchorages, from quaint fishing villages with traditional tavernas to the more lively resorts that will get you partying with the rest of them. Your Greek charter itinerary can provide you with short hops or longer distance sailing but whichever you choose there's a fantastic choice of activities awaiting you in the Ionian. The Aegean islands of the Northern Sporades are ever popular with sailors looking to explore golden sands, crystal clear waters and quaint little villages on a Milina sailing itinerary. The Northern Sporades are characterized by enchanting forests reaching all the way to the beaches. The close distances between the other Sporades islands make Milina an ideal starting point for short hops.